While other artists utilize branding in order to make specific points about their work, for Richard Prince the brand has often become the work itself. 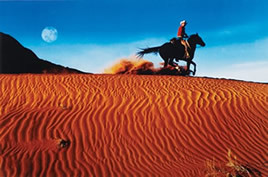 In the late 1970s he started re-photographing images from various commercial sources, the most famous of which were the 'Marlboro Man' tobacco campaigns. Yet Prince is only concerned with brand identity insofar as it happens to supply him with imagery he desires. The origin of 'Cowboy' is unacknowledged, the original advertisement stripped of copy and presented as a new work. Deprived of context, Prince negates the image's former significance and appropriates it entirely as his own. Shopping and fashion brands - or even shopping for fashion brands - is a recurring theme in the work of Swiss artist Sylvie Fleury. In it, a playful sense of humor is combined with serious reflection on consumerism, branding and art itself. 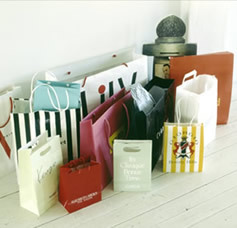 One of Fleury's first exhibited works, 'Shopping', consists of designer label shopping bags installed on the gallery floor. "I liked the idea that the work could be completely superficial." Fleury has said. "There was also the idea of seduction, the idea of brands, names, labels... "
Perhaps most importantly, however, the piece demonstrates that if luxury brands can be art, art can be a form of luxury brand, too. Later works - in which, for example, ripped designer jeans become an ersatz Fontana - further emphasize the notion that well-known art is itself a product that can simply be transposed onto another. Tom Sachs began his career applying big-name branding to objects whose associations implied pointed criticism of the marketing process. 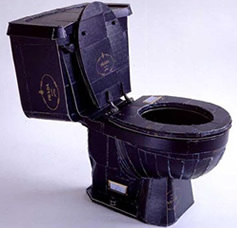 His 'Prada toilet', for example, is constructed of the couture house's packaging, a strategy that was replicated in 1999 with 'Prada Death Camp', a miniature model of a concentration camp made out of a Prada hatbox. Chanel's iconic logo covers the surface of the 'Chanel guillotine', and Sachs has also transposed luxury branding onto decidedly low-key products - an Hermès McDonald's cup, for example. In recent years, however, Sachs has begun to work in tandem with the companies he appeared to be critiquing. In his 2007 'Space Program' show at the Gagosian, Prada contributed designer lab coats emblazoned with the NASA logo, while Nike's in-house design team created a 'moon-walk' footwear system. Banana Republic also worked with Sachs to design editioned T-shirts sold via the gallery. With big-name artists often a brand in their own right, in recent years major companies have been especially willing to harness the marketing power of contemporary art. Collaborations which, for some, are inevitably seen as capitulation to corporate might, are the theme of our next section.